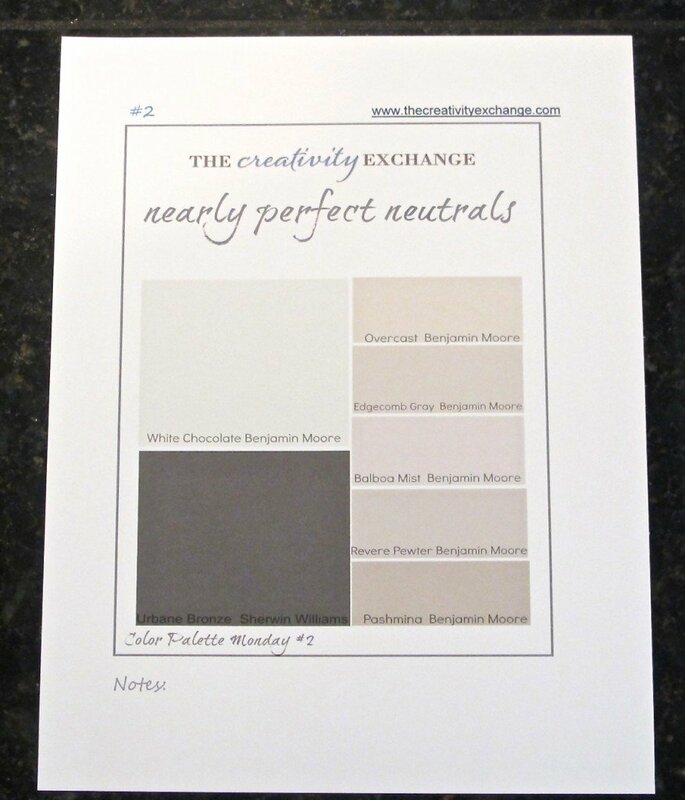 Nearly Perfect Neutrals (Color Palette Monday #2).. If you happened to miss it last week, I kicked off a new weekly feature that I’m calling “Color Palette Monday”. 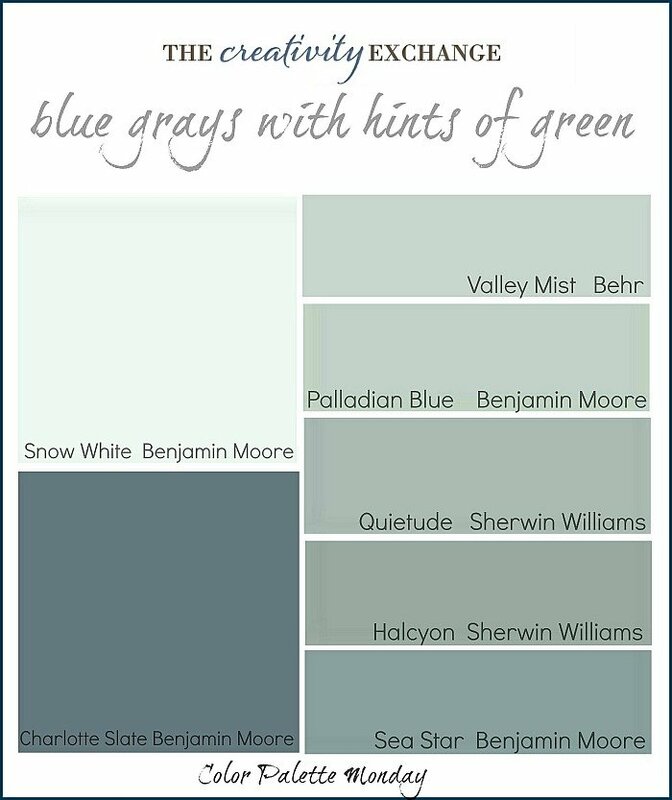 My goal is to share color palette ideas from some of the most common paint color questions that I have received from readers. I know it’s challenging to find just the right color and I hope that this new feature will help you sift through the myriad of paint colors out there! These printable palettes should not be a substitute for paint color cards, but they will give you an excellent feel for the color and the slight differences. Believe it or not, printing out a paint color image comes a lot closer to showing the true color than a computer monitor does (unless your printer is low on ink!). You can print these palettes out on standard copy paper but the quality of the color is so much better printed on standard 8.5″ x 11″ smooth card stock (no fiber/linen lines). So this week’s color palette (#2) is inspired from another one of the most common question that I receive from readers; what is a perfect neutral paint color that always looks beautiful in any space? 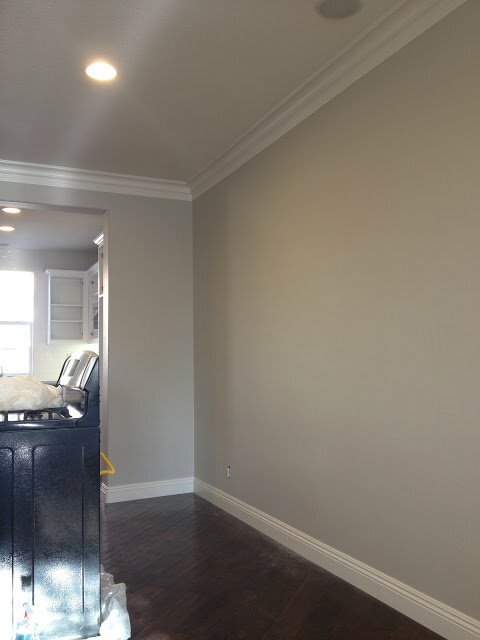 I get this question from people who are looking to find a wall color that will update a space instantly but most importantly, they want something that is a tried and true “safe” paint color. 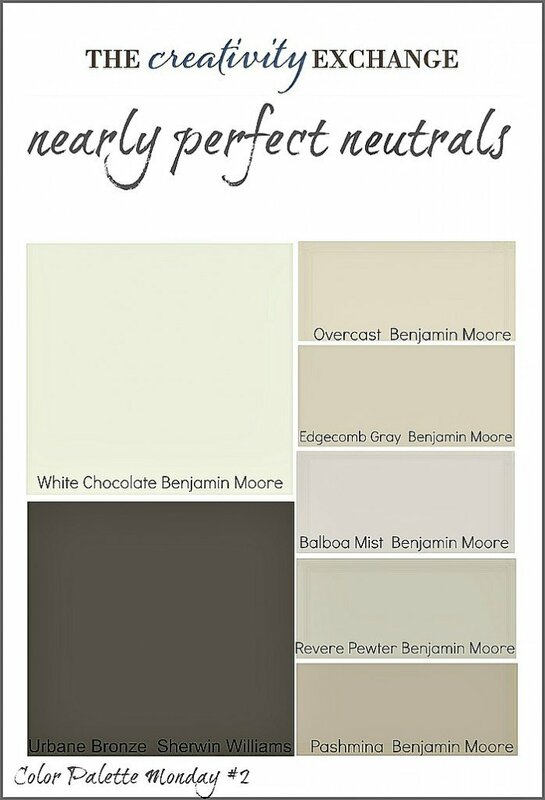 Unfortunately, there is no such thing as a “perfect” neutral paint color but there are some “nearly” perfect neutrals out there. 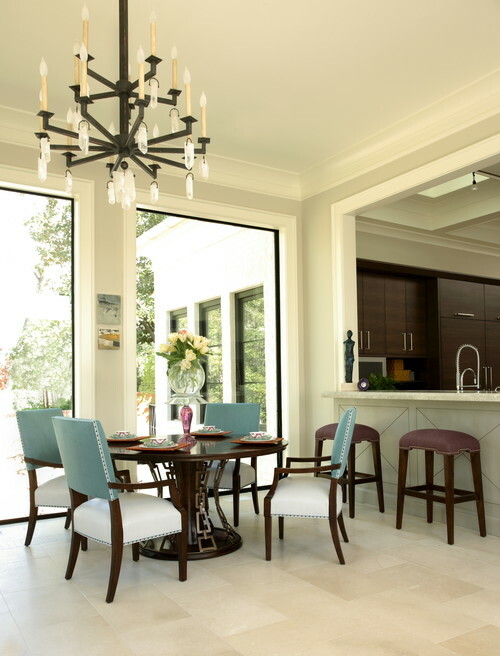 These are neutrals that consistently work well in a variety of lighting situations and because of this, they are not only popular with consumers but they are also favorites of home builders and designers. These colors are not a guarantee but it’s as close as we can get to finding a tried and true neutral and it’s certainly worth a closer look. 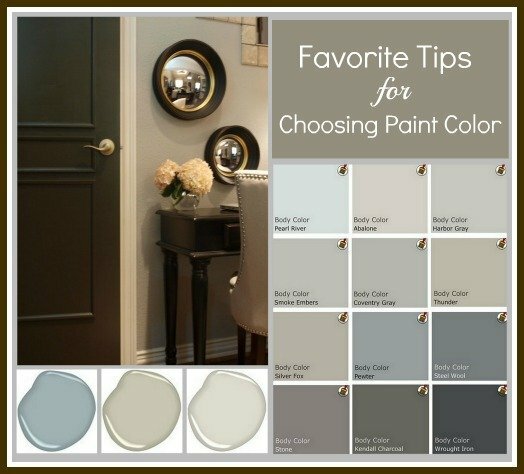 (The top left color on the palette will always be a suggested trim or ceiling color. The lower left color will always be the darkest of the palette and would be good for fabric accents or a possible complimentary color to paint furniture in the space with the coordinated lighter colors. The dark color could also be a great wall color as well). 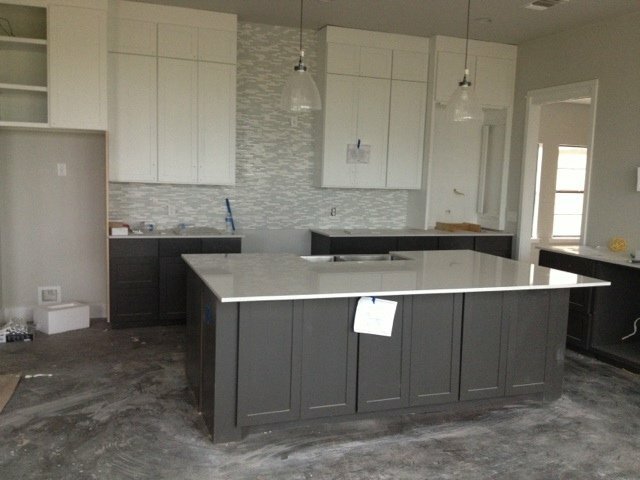 If you search the color “Revere Pewter” on Houzz, more than 2,400 rooms painted in this color will come up, which shows you just how popular this color is right now with builders, architects and designers. 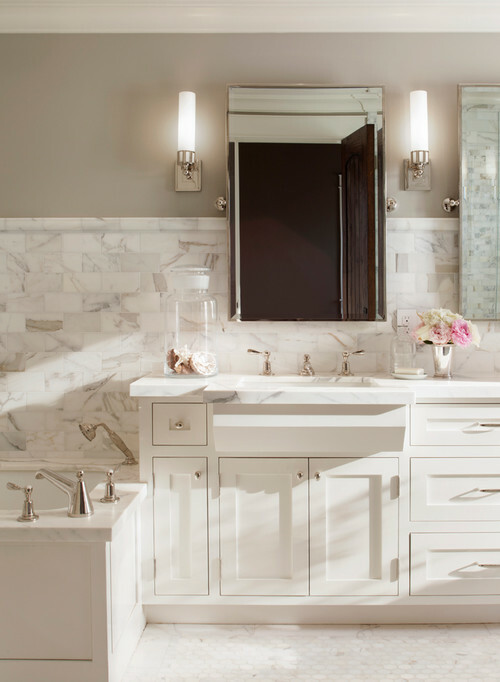 Depending on the lighting in your space, Revere Pewter will lean gray-ish or light tan-ish. I have also seen situations (tons of natural light) where Revere Pewter looked off white. 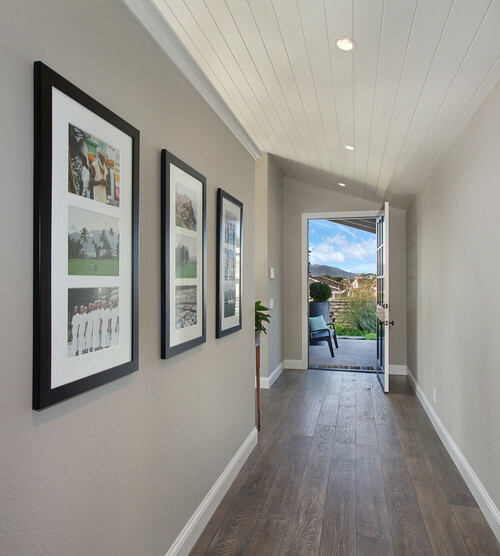 While this color seems to work really well in almost every space, I think the ideal lighting for Revere Pewter is rooms that do not have a lot of natural light like entry ways, bedrooms, bathrooms, etc. This is great because these are the hardest spaces to nail a paint color. 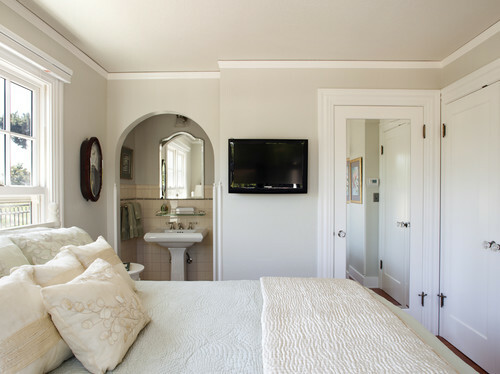 Traditional Bedroom by San Jose Architect Arch Studio, Inc. I haven’t seen a room painted in Edgecomb Gray that I didn’t absolutely love. 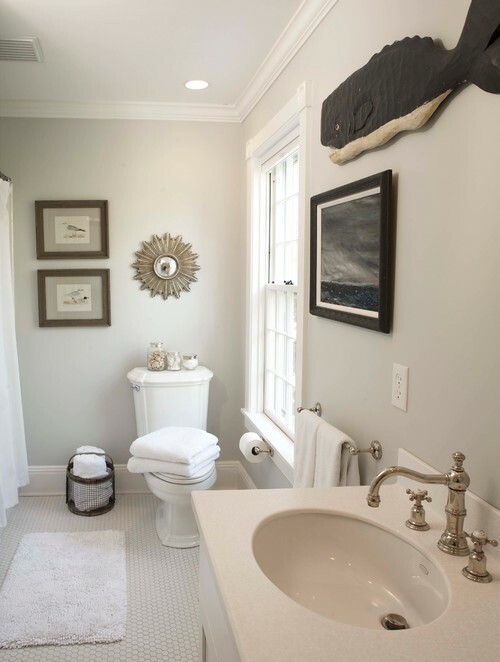 It works beautifully in almost any space including kitchens and bathrooms and I am seeing it paired a lot with Benjamin Moore Cotton Balls for trim and it’s a beautiful combination. It’s really hard to find lighter neutrals that are rich with a lot of depth and Edgecomb Gray is one of those colors and probably my favorite from today’s color palette. 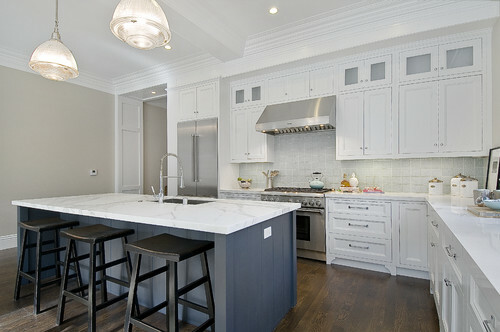 Traditional Kitchen by San Francisco General Contractor Cardea Building Co.
By the way, Urbane Bronze is a fantastic interior door color too! Is there a color here that’s jumping out at you or do you already have one of these colors in your home and can share what you like (and dislike) about it? I would love to hear your thoughts! I am really excited about this new feature and I can’t wait to share some pretty color palette inspiration in the weeks to come. 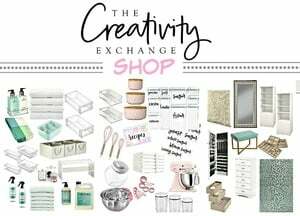 If you have any suggestions for future Color Palette Mondays or any paint questions, I would love for you to share in the comment section below. I am so into neutrals and have been blogging about them too. 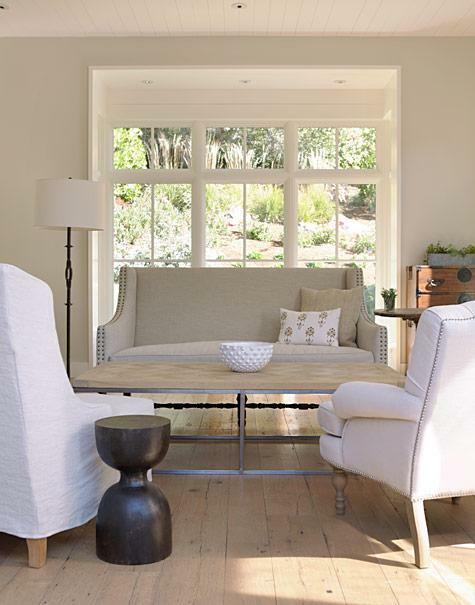 I love that “Remodelista” image, the sofa works perfect in that deep window. I saw a similar sofa which I thought might work in my own home but they are not the most comfortable to sit on but definitely look lovely. I am planning to remove my summer blue and white pillows from my living area and replace them with neutral mixed patterns of beige and white and hopefully some interesting textures too. It’s mid Autumn and I need a change back to natural tones. Thanks Lee! I loved your inspiration post and was drooling all the way through! 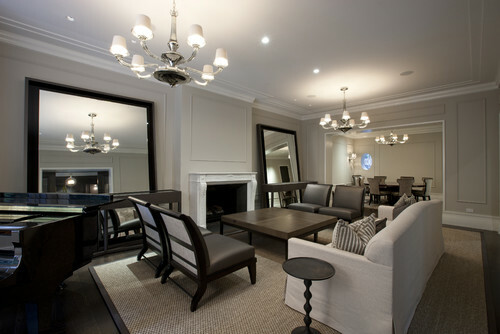 I love the idea of layering with neutrals and adding depth with textures. I especially loved the natural elements that you shared as well. Very calming! Thanks so much for stopping by! 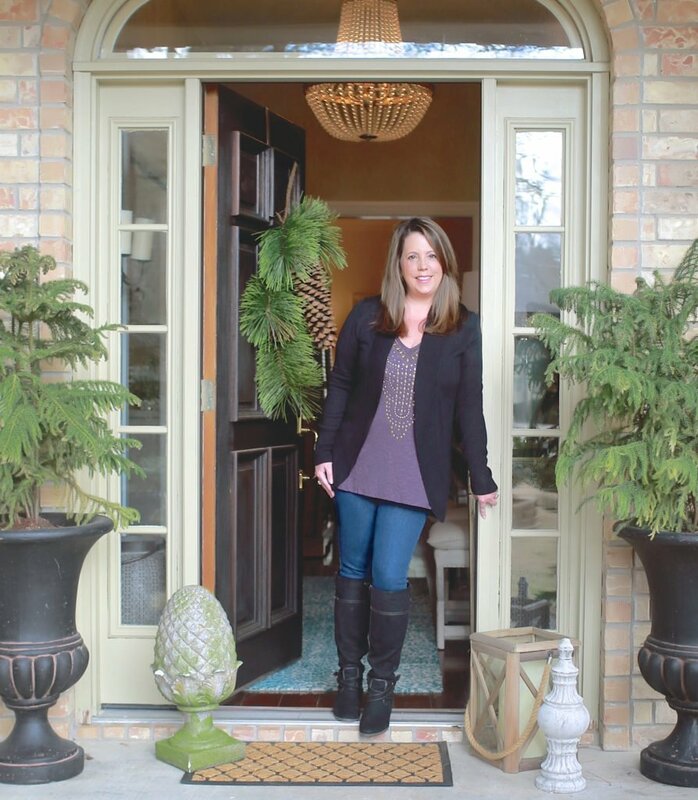 Love all the tips but one question…all the beautiful rooms have dark wood floors and mine are all natural oak(which I love because it fills the rooms with light). Will the neutrals with gray tones work for me? Love all your ideas on choosing the perfect color. Regarding the neutral color palette- Do all the above neutrals have the same undertones and can they all work together? I love revere pewter but need to use a grey/beige along with it do you have a suggestion? Help! I have Northwest exposure with a skylight and lots of windows facing North, so soft cool grey-ish light. Except in the afternoon when it goes yellow glowing Western. All my furniture is what they used to call Autum colors. Burnt red sectional- gold loveseat – chocolate chair. I can’t pick a light neutral! It either looks gray and drab or cold or… I don’t want to make the room dark and oppressive (I considered white and thought it would be too stark). On the Traditional Entry picture by Laguna Beach Architect Anders Lasater Architects, it says the walls are Pashmina Gray. Is there any way to find out the name of the floors?